Up until two months ago, I was working in the beauty industry which meant a full face of makeup everyday. Now don't get me wrong, I love makeup (obviously) but it does get a bit tedious doing it everyday, five days a week. I definitely found myself dreading putting my makeup on sometimes, a feeling I never thought I'd have! Now that I'm working outside the industry, I've found myself having a lot more freedom and I've been really enjoying mixing things up a little. 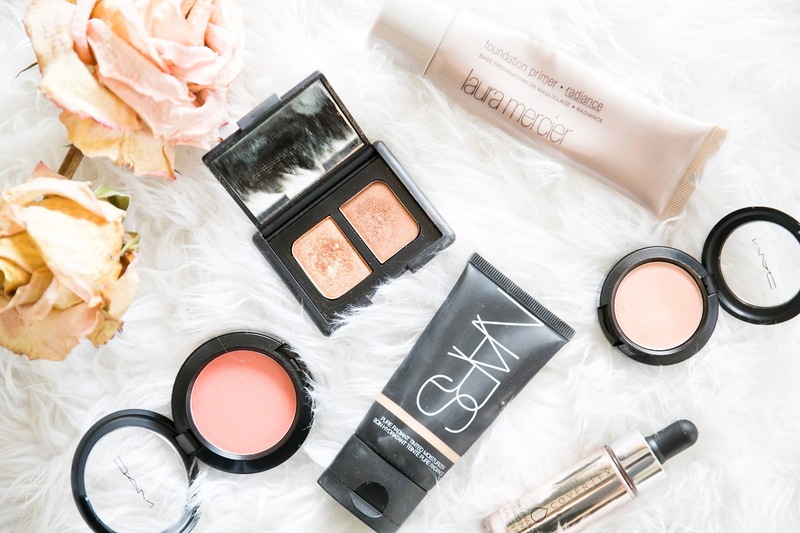 I've been able to reach for old makeup favourites I haven't been able to use in years, and have fallen back in love with key items all over again! This winter, I've been really enjoying paring back my look and making it as easy, and as simple as possible. I've also been tricking myself into thinking it's summer by trying to look as bronzed and glowy as possible - it's been working really well until I've had to put my coat and scarf on to walk to the train station every morning, ugh. Please hurry up, summer?! 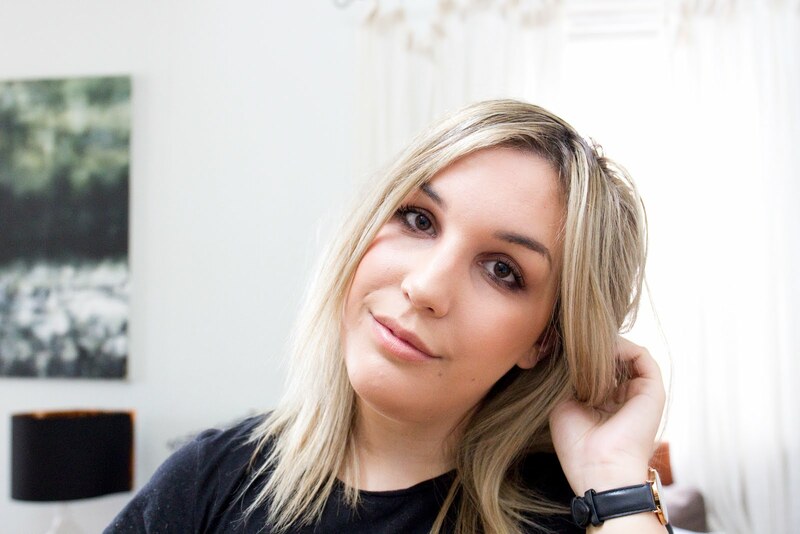 In place of my usual foundation favourites, I've instead been favouring a combination of my all time favourite primer, the Laura Mercier Foundation Primer - Radiance and my trusty Nars Pure Radiant Tinted Moisturiser. For a tinted moisturiser, it actually has a fair amount of coverage and mixed with the Laura Mercier primer, it has the most beautiful, natural and glowy finish. I don't think I'll ever stop loving these two products, I've gone through countless tubes of both! For the cheeks, I've actually been loving a few different products. I've been leaning towards cream products for a while now, as sometimes I think when you're going for that dewy look and you add a powder cheek product, it sometimes takes away the dewy effect? So I've recently purchased both the Mac Cremeblend Blush in Something Special (which doesn't seem to be on the website) and Mac Cream Colour Base in Hush. The blush is just a super pretty peach, and I genuinely prefer the finish over powder blushes (although I obviously still love them, too). It definitely comes off more natural, and wasn't as scary to apply as I thought! I still have my Stila Convertible Colour in Petunia which was really nice, but much harder to apply in my opinion. As for Hush - such an incredible, glowy cream highlighter. It falls on the more subtle side, but sometimes that's all you need. I just pat it on with my fingers, and it leaves this super pretty, peachy toned highlight. It's great for more medium type complexions, as it isn't too pale and instead looks like a natural glow, which is what we all want, right? I just recently attended IMATS for the first time, and although I mostly went to purchase brushes (and that I did), I did pick up one makeup item as I couldn't resist the generous discount. I caved and purchased the Cover FX Custom Enhancer Drops in Celestial as I was super keen to have a more pigmented, liquid highlighter on hand. Pigmented, it is. I love liquid highlighters as they are SO versatile - if I don't just pat it on my cheeks as it is, I'll mix it in with my foundation or moisturiser for a custom glowy base. I love it as I think that's a much easier option than trying to find a luminous foundation (which is SO hard, why??). The colour Celestial is definitely more on that pink side which is okay for myself, although I would love to grab a more golden toned one to have, too. The last product I want to mention is one of my OLDEST makeup items. The Nars Eyeshadow Duo in Isolde is the first high end makeup product I ever purchased (I think - Mac Studio Fix Foundation might have been first, I can't remember). I remember seeing a blog post from Emma years and years ago where she wore this eyeshadow duo and I remember thinking I HAD to have it. The Nars Eyeshadow Duo's go down as being some of the best eyeshadow formulas I've ever used. Super pigmented and buttery, but without the insane fall down. I feel like these bronzey colours compliment just about anyone, and it definitely makes me feel super sunkissed when I brush it on, not to mention it's ridiculously easy to just pop on with a bit of mascara! What makeup products have you been loving lately? Definitely hit me up if you have any of your own bronzey, glowy recommendations!